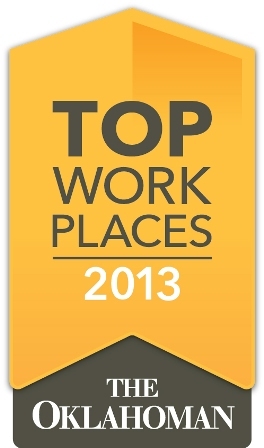 GableGotwals is pleased to recognized by The Oklahoman as a part of the Top Workplaces in Oklahoma. In addition to being among an elite group of only 50 companies selected, GableGotwals was the only law firm included as an honoree. To find the Top Workplaces in Oklahoma, The Oklahoman partnered with Pennsylvania-based survey firm WorkplaceDynamics LLC, which has administered surveys to millions of employees since its founding in 2006. A total of 795 companies with at least 35 employees were invited to participate in the survey of which 89 companies participated. Employees taking the survey were asked to grade their workplaces in areas such as the employer’s direction, connection and execution, as well as their own feelings about their work, manager and pay and benefits. Among the questions were if the company was going in the right direction; if the employee has confidence in the leader; how confident the employee is about his or her future at the company; and whether new ideas are encouraged at the workplace. Employees were also asked about training, work-life balance and compensation. Employers were divided into size bands and ranked within their size category to come up with the Top Workplaces in Oklahoma. The Oklahoman was not informed of the scores of each employer. WorkplaceDynamics ranked the top 10 for large, top 10 midsize and the top 30 small employers based of the 13,250 employee responses. Cardinal Engineering, Inc. d.b.a. Lemke Land Surveying, Inc.